Need more information about booking Home 6790056 ? Ferrymans Cottage - formerly part of the infamous Sailor's Return Inn - is just 4 minutes walk along the Riverside from the centre of the bustling up-beat town. Not only with water views but two decks actually above the water, perched above the old slipway. There, great fun for kids (and adults!) 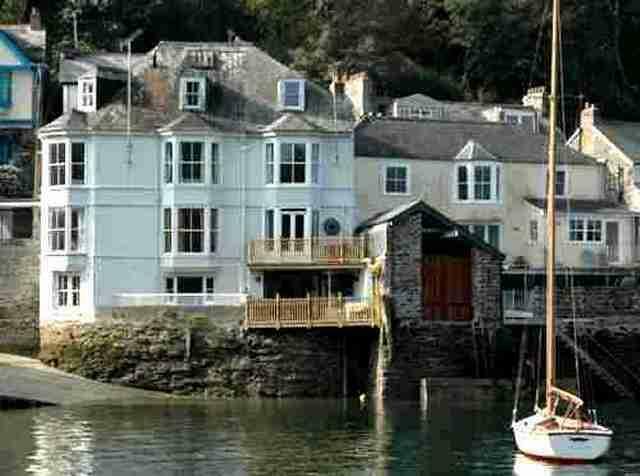 to crab and fish, Over the river, a magnificent view of Ferryside, Daphne du Maurier's first house in Fowey; The Boddinick ferry plies to and from nearby Caffa Mill, there a car park where a weekly parking ticket can be bought.. Being also a family house for the owners, we find guests surprised at the extent of facilities, crockery; 'you name it! It's a family house. At entrance level, a Study, Shower room with WC and Lounge with TV and log effect fire opens to a deck. Down the stairs, leads to the Kitchen with (tall cooks beware) beamed ceiling and full faciitites. The Dining room, with log effect stove, opens to another deck with BBQ, table and chairs and, if the tide isn't lapping on the deck, a ladder to the beach. There's a 'frape' mooring for small boats which are moored off-shore but can be pulled to the deck, fees arranged with the Harbour Master. Rising from the entrance level, stairs takes us to the main Bathroom and two double Bedrooms, one with bay window overlooking the constantly changing river scene. Further stairs take us to two more Bedrooms, one a double with river view, the other a single bed plus a full length bunk bed pair. All bedrooms have central heating, wash basins; linen and towels are provided. Guests like it because it's "querky". We have, in renovations, kept the old charm of Cornwall, thick slate walls and re-used ships timbers as it was in times of the Sailor's Return. This House has 4 bedrooms, 2 bathrooms and sleeps 8. It’s been listed on Holiday Lettings since 24 Sep 2015. Located in Cornwall, it has 8 reviews with an overall rating of 4.5. The average weekly rate varies from £623 to £1503. The Owner has a response rate of 81% and the property’s calendar was last updated on 13 Apr 2019. We love Ferrymans and return every year. The location is brilliant, a short walk into town and very close to the car parks which is really convenient (car parking in Fowey is difficult). The views from Ferrymans are fantastic (mum always says it is "like being on a cruise ship") as it is so close to the water and all you can see from the windows is the river. When the tide comes in, the water goes right up to the house, so you almost feel as if you are on a boat. Ferrymans is not one of those "modern" holiday houses, if you like white, spotless, miniminist decor it is not for you. Ferrymans is quirky and very different to your usual holiday let, but it is warm and cosy and you will feel instantly at home. It should be noted though that it is definitely not suitable for those of limited mobility as there are a lot of stairs! We love the kitchen at the bottom of the house, where the old inn cellar was. It looks out on to the deck and having breakfast outside in the sunshine on the deck looking out over the river is a must. We spend a lot of time out there on the deck and it is very difficult to leave to go out for the day! I am one of those people who prefer to go to a new place for each holiday to get new experiences, but for some reason Ferrymans is the one place we always love to return to and will never tire of. I can highly recommend it! Owner's reply: It is what we (dear Jean, not sadly now. pattt of the scene) aimed for over the years. A degree of quirkiness; held on to and not imitable. Welcome return, Sailors!